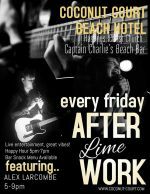 Every Friday, head to Captain Charlie's Beach Bar in the Coconut Court Beach Hotel for their After Work Lime. Live Entertainment by Alex Larcombe. Happy Hour is 5:00 pm to 7:00 pm.